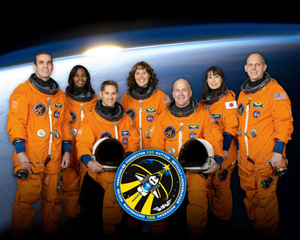 Clay Anderson (far right) and the rest of the STS131 crew. The only Iowa State University graduate to go into space is getting an opportunity for a repeat trip. Astronaut Clay Anderson is assigned to the next space shuttle flight, as the shuttle Discovery heads to the International Space Station. Anderson will do several spacewalks on the mission, which is set to launch April 5th. It’ll be his second trip into orbit as he spent five months living aboard the space station in 2007. Anderson’s 51st birthday is next Tuesday. He’s a native of Ashland, Nebraska, and got his master of science degree in Aerospace Engineering at Iowa State University in 1983.